description A half-length portrait of a seated Rabbi, seen in three-quarters profile facing left. The painting has been executed using loose brushstrokes and thinned paint applied in short brush strokes to build layers of colour in the background, and in longer strokes, but more sparingly applied, to the body. 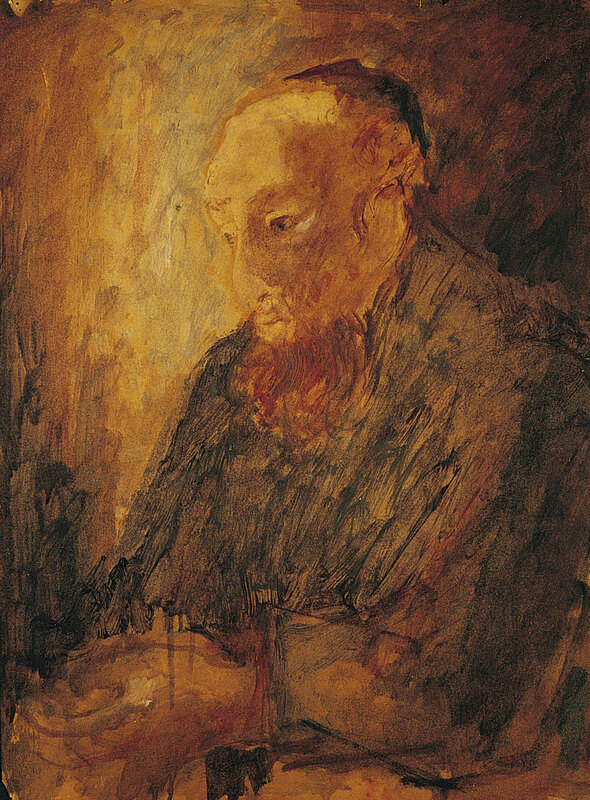 The sombre palette is offset by the ochre tones of the face and of the wall immediately behind the rabbi. When exhibited in 1952, the work was admired by the critic of 'Art News', who recalled 'the free brushwork of Eva Frankfurther's monochromatic oil sketches on paper', as 'at its most powerful in (no. 78) "Rabbi"'. The work was later given to the artist's parents as a gift. Frankfurther made a number of portraits of Orthodox Jewish subjects both in London's East End and later, in 1958, in Israel. exhibition history “East End Academy: Annual Exhibition”, Whitechapel Art Gallery, 77-82 Whitechapel High St, London E1 7QX, 13 Nov-7 Dec 1952, (78), not priced. literature 'Art News, IV, no. 31', 1952; ed., B. Planskoy, 'Eva Frankfurther 1930-1959: Paintings, lithographs and drawings' (London: Peter Halban, 2001), illus., p. 53.